For the winner of the first race of the season. In honor of Cal and Joy Beisswanger sailors of one of the original M-16s on the lake. In their boat, Beguiler, they won many races! This Cup was donated by Chuck Bradley to honor the son, Bill. Chuck is one of the founders of the LLSC. This race is normally raced on the Fathers�s Day and for many years was referred to as the Father�s Day Race. Currently it is called the Bradley Cup. This race began in 1996 and is usually raced in either Middle or Mill Lake. This cup was donated by Walker Johnson to honor Rod and Jodie Nystul who served as Commodore and Secretary / Treasurer from 1988 to 1999. During their joint management of the Club, it grew from an average of 4-8 boats sailing each Sunday to 14-18 boats each Sunday. They accomplished this with their enthusiasm for sailing and their willingness to help any and all newcomers to learn to race. Many current members attribute their membership to the “warm welcome” atmosphere created by the Nystuls. In addition, it was Rod and Skip Cartland who designed and implemented our unique Starting System that gives all sailors a chance to win. 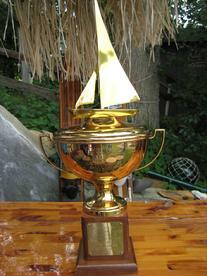 The RoJo cup race was started in 2000 and Rod was its first winner. Bud Weiser was one of the founders of the LLSC and sailed with us into his late 70�s. We started a race in his honor in 1985. The original �Cup� was actually a Miller�s quarter barrel that Peter Van Kampen had from his college days. We wrote Bud Wiser on the barrel, attached the top of an old sailing trophy and attempted to stamp the winners onto the aluminum. However that aluminum was way too hard so we ended up simply writing the names with black marker. Dave Asbach, who won this cup more times than anyone else, got tired of storing the quarter barrel and replaced it with a silver bowl and wooden stand which we continue to use. Tim Walsh was a long time member of the LLYC serving as Commodore for the years 1990 and 91. He got into sailing in the early 90's and joined the club. In the late 90's he introduced his son Scott to sailing. Scott was a quick study and soon became a contenter. 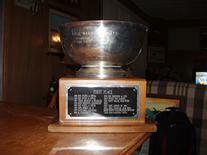 Scott won both the LLYC and LLSC seriers in 2005. By then Tim and Mo were out on the pontoon boat cheering Scott on and serving as rescue boat for those that capsized. Tim was a great asset to both Clubs and is being honored with this traveling Trophy. 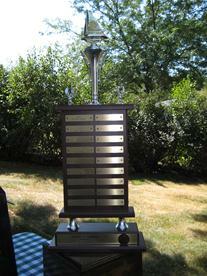 Scott won the trophy in the first year. This granite obelisk is given to the winner of the last race of the season. 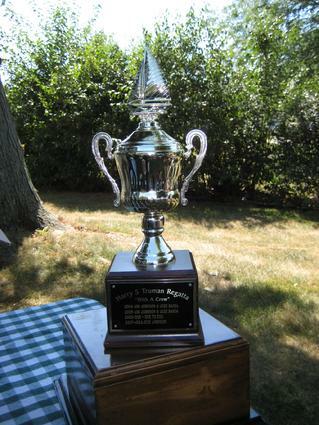 The Cup began in 2005 to honor Skip Cartland and his 30 plus years of leadership and support of the Club. Skip knew the Rules. He was our Rules guru from the time he came on the lake in 1972. The rest of us simply did what he said as opposed to learning all the rules which seemed an impossible task. Each year Skip would go over the rules at the spring meeting and most of us still didn�t understand most of it. But he was always there to clarify a dispute and little by little we finally got it. Skip also served as First Commodore of the Club beginning in 1974. Prior to 1974 the Club was less formally organized. In honor of those who support our racers in their weekly quest for a win! This race was started in 1976 by Peter and Mary Lou Van Kampen. It was their first year in the Club and back then the last race of the year was on Labor Day weekend. They wanted just one more race in the season and took it upon themselves to promote this race the Sunday after Labor Day. The fact that after Labor Day there are far fewer boats on the lakes prompted them to sail through the Channel from Green Lake into the other Lakes. Peter and Mary went around the lakes a few weekends in advance and put fliers on every sailboat on the lake. Everyone was welcome to join and we got a pretty good turnout. We once had a sailing Canoe race with us and several times Wind Surfers joined in. There was a prize for the top three M-16�s (the most common boat in the Club then) and another three prizes for the top three handicap boats. Skip would calculate the time the race took, the speed of the wind and from one of his books came up with a handicap for every kind of boat that entered the race. There original trophy was one that Peter made up using parts of an old baseball trophy from his brother in law Buzz, with a sailboat on top that he got from Cal Bieswanger another sailor in the club. 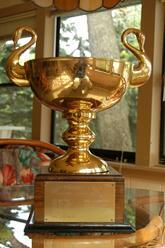 That trophy was replaced with a much nicer one by Dave Asbach ( a multiple winner of this cup). The current cup still has a copper medallion of Harry that was part of the original Cup. For several years everyone participating in the race received a bumper sticker stating that �I sailed the Harry S Truman Regatta. The stickers were donated by Peter�s brother Phil who owned a print shop in Madison. 1993 Uff-Da! Its Uff-Da Again! 1987 N'Joy - Wally Yandel! 1984 No. 3 for S. & C.
Jim and Judi Johnson donated a cup to be given as a traveling trophy to the Double Handed winners of the Harry S Truman race. Several people had been talking about offering such a trophy for persons who wanted to bring along a spouse or grand daughter etc. The Johnsons went on to win the race the first time the trophy was offered and every year since except for the 2006 season when we had no wind, just fog and the race was cancelled.